So, bring your blanket, bring the whole family, but don’t bring any pets, and spend summer’s final weekend at the Grant Park Summer Shade Festival presented by the Beacon Atlanta. The Grant Park Summer Shade Festival is an annual fundraiser for the Grant Park Conservancy (GPC), a non-profit, membership-based organization committed to the restoration, renovation, beautification and maintenance of historic Grant Park. Thank you for attending, and we hope you enjoy your final hurrah of summer! It wouldn’t be a festival without something special for our young visitors, and Summer Shade has got that covered. Children of all ages can enjoy the Summer Shade Festival Kids Zone presented by Children’s Healthcare of Atlanta-Hughes Spalding. 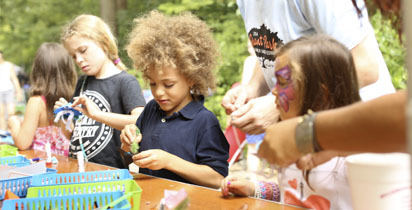 The Kids Zone features art activities, as well as active options such a bungee jump and more. Don’t worry- we’ll keep the kiddos entertained! 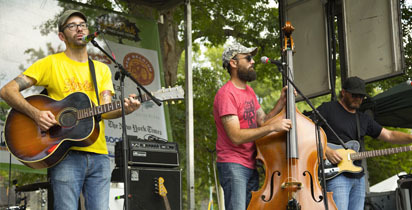 The Grant Park Summer Shade Festival has earned a reputation as the place to see some of the hottest up-and-coming bands as well as a plethora of local talent. With two stages keeping the tunes flowing all weekend, Summer Shade stages offer a range of genres and plenty of greenspace from which to enjoy them. The Grant Park Summer Shade Festival kicks off on Saturday morning with the Adams Realtors Run for the Park 5K. Runners, walkers and strollers are welcome to participate. With awards by age group, a tot trot and a stroller race, the Adams Realtors 5K raises funds to support the Grant Park Conservancy.